Yesterday I read about a coconut pie served at a New Jersey restaurant called The Claremont Diner. It was a favorite of the cookbook author Richard Sax, who says in his book “Classic Home Desserts” that the Claremont’s pies were “showy”, but also made from scratch and with top quality ingredients. After looking over the recipe posted in Sax’s book (it’s also posted on The Hungry Browser), I ran to the store, bought all the ingredients and baked it that afternoon. 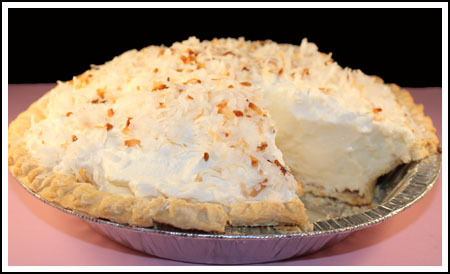 We love just about all coconut cream pies, but this one was special in that it was similar to a Bavarian Cream. That is, it had just enough gelatin to make stiff enough to hold its shape, while still being light and creamy. In the original recipe, Richard Sax includes a note saying the diner put a topping of whipped cream over the pie and gives alternate directions should you wish to do that as well. I did, so I went ahead and re-wrote the recipe with the added whipped cream. Due to time constraints and not wanting to mess up more dishes, I used a store-bought pie crust. The filling was so good it didn’t matter much, but next time I’ll take the time to bake my own crust. At any rate, it’s a great pie and much lighter than a lot of other coconut pies. It’s not too “coconutty” either. It’s more like a vanilla cream pie with coconut on it. Place 1/2 cup cold milk in a mixing bowl and sprinkle with the gelatin, stirring once or twice to moisten. Set aside to soften for about 5 minutes. Bring the remaining 2 1/2 cups milk nearly to nearly a boil in a heavy non-reactive saucepan over medium heat. When the gelatin is soft, add the sugar, cornstarch, egg and egg yolks and whisk until very well blended. Gradually whisk a little of the hot milk into the gelatin mixture; repeat this process once or twice using about 3/4 cup of the hot milk total. Pour the warmed gelatin mixture into the saucepan with the hot milk and bring the mixture to a boil, whisking. Boil, whisking constantly, for about 2 minutes. Strain the pastry cream into a clean bowl; whisk in the butter and vanilla until smooth. Place a sheet of wax paper or plastic wrap directly on the surface of the pastry cream and refrigerate. Whip the 1 ½ cups cream until nearly stiff. Stir in the powdered sugar and vanilla. Gently fold a little over half of it into the pastry cream. 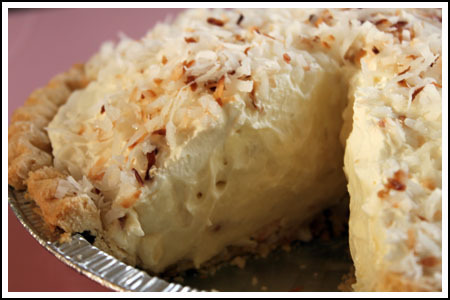 Sprinkle a big handful of the coconut in the bottom of the baked pie shell. Pour the filling into the pie shell, mounding the filling in the center. Chill for about 30 minutes. Spread reserved whipped cream over Bavarian cream and sprinkle top with remaining toasted coconut. Chill for four or five hours or until set. ** To toast coconut, spread coconut on a foil or parchment lined cookie sheet and bake at 350 for 8-10 minutes, stirring frequently to keep it from burning. I have had the original Sax recipe for almost 30 years now and it is absolutely delicious. I made it many years ago and took it with me to my friend’s family Easter dinner. It was such a hit that her parents still talk about ‘that pie’. I am hesitant to make crust from scratch and have made this using pie crust dough already made but it turns out beautifully and no one knows the difference because the pie itself is so good. I am from NJ and am so excited to find the original recipe from the Claremont Diner for coconut cream pie. I can’t wait to try it. I dream of the wonderful pies and food at the Claremont. Those kinds of places just don’t exist anymore. Great memories, thanks. Have to make just one more comment about this recipe……Since my last comment, i have had a few more pieces of coconut cream pie made by other people and im glad to report…..mine is still the best. Make this recipe and you will be glad you did, others just dont come close. Enjoy! Made this yesterday and yes, ……it is the best!!!! Try it …you will love it. **. Anna explains how to toast coconut. My husband loves coconut cream pie. I’m for sure going to have to make this for him. Thanks for another great recipe! That is the most gorgeous pie! I’m drooling. This really looks interesting, and I’m putting it on my baking list. This is much easier than the coconut pie I’ve always made from fresh coconut. Just opening those things is a chore! Mmmmm! I’m going to have to make this one for my pops. After cherry pie, coconut cream is his 2nd favorite. coconut & banana cream pie, if done right are my downfall–I will eat the whole thing. I think your idea of using a graham cracker crust is perfect. This looks good enough to dig into, right on the screen. LOL I have a spare pie crust in the freezer and have been toying with making a coconut cream pie with it. I think your photo and recipe seals the deal. However, I will challenge myself to make it vegan. (I’m not vegan, but love desserts so much that I’m always seeking ways to make them a bit healthier while not sacrificing flavor. Wish me luck. 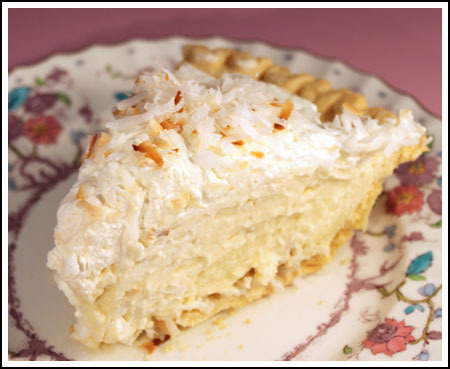 Coconut pie is my son’s favorite he would be in hog heaven if I made this for him. Once again, I gotta sing the praises of CI’s CCpie, its amazing. Oh, yum. Can you hear my stomach growling? Did I miss something? I’m trying to figure out why you put ** after “toasted.” I’m probably just overlooking it, but…? I’ve got to try this pie soon! I love coconut – anything and everything! This looks delicious and may be just what I’m looking for. It’s really thick, too, and I like that. My husband would be thrilled if I made this pie for him. He loves coconut cream and banana cream and the poor man never gets either one! I want to try it again with a graham cracker crust. Look at that! That pie looks perfect! It’s huge. Coconut cream pie is my favorite kind. Now I feel a need for coconut. I love this pie too, but I really love Coconut Custard Pie. The diner pies in New Jersey are usually 6″ high and have their own revolving case. The late Richard Sax had some fantastic recipes. “The Cookie Lover’s Cookie Book” from 1986 is worth searching for in used books if only for the recipe for Date Chewies with Sour Cream. Looks and I’m sure tastes amazing! This is my ALL time favorite pie!